Hunger for food and hunger for knowledge. Coming to today’s recipe, I have not baked cookies for quite a while. The last was the anzac biscuits. I was craving for cookies…. I sometimes love to dunk in cookie in my tea. I went to the biscuit aisle at Nakumatt and came back without buying any of the cookies. The local ones are horrible, the imported ones are frightfully expensive and the ones from India were out of stock. So I opened my recipe book and chose to bake wholewheat almond cookies. Do you often do a good deed for the less fortunate ? Preheat the oven to 180°C. Grease baking trays lightly with butter. Sieve the flour,cardamom powder, baking soda and baking powder together. Add the chopped almonds and mix well. Add sugar and butter in a bowl and whisk or beat it till it soft and creamy. Add the milk and mix till it is incorporated into the sugar butter mixture. Add the flower and mix to form a dough. Take a tablespoon full of the dough and roll it into a ball. Press it between your palms or press it with a fork after placing it on the tray. Repeat steps 7 and 8 with the remaining dough. Place the rolled dough about an inch apart. Bake in the oven for 15 -20 minutes or till the tops are golden brown. Leave the cookies on the tray for 2-3 minutes and then remove them and place on a wire rack to cool. Add cinnamon or nutmeg if you like. To get the dome shaped cookies, press the ball of dough between your palms. To get a flat shape cookie, press it down with a fork. These cookies will have a crunchy top and the inside will be soft. If the dough becomes a bit dry, add more milk. Some wheat flours will absorb more liquid than others. Lovely initiative! 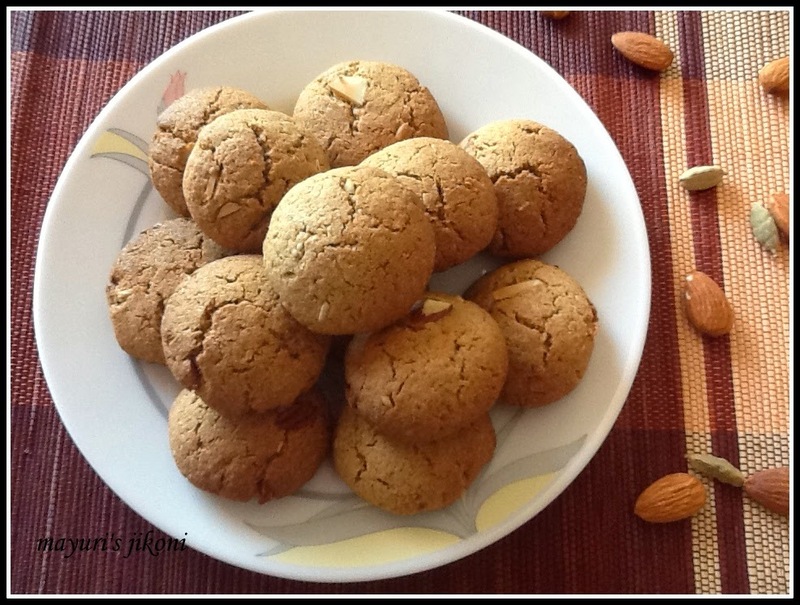 These healthy cookies are simply fabulous! I love baking with almonds. These sound so delicious too.